← Marshfield Football Coach Let Go – Because of His Age? Ever since I can remember, I’ve wanted to go to Hawaii. I never focused on which islands, in fact I used to think of Hawaii as just one island. As I’ve gotten older, the trip has moved up my bucket list. Then along comes my wonderful new husband, Roger. He had visited the islands a couple of times, years ago. So when we talked about a honeymoon, I lobbied to go there. Since we had a summer wedding and didn’t want to leave our beautiful Plymouth pond, we decided to go this winter. we booked a two week trip, one week on the big island and the second week on Maui. I was a little worried that I had built up going to Hawaii as such a big deal that I would end up being disappointed. That was certainly not the case! 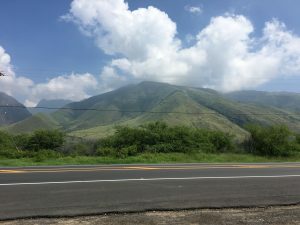 We decided to visit Maui and Kona, two islands that we believed to be less commercial than Oahu. 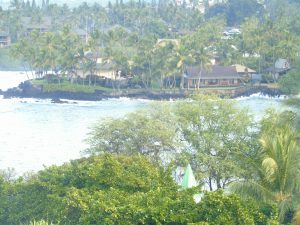 We started with Kona, “the big island”, known for its coffee farms and an active volcano. We spent a week there, visiting an organic coffee farm, snorkeling with sea turtles, zip long through the rain forest, going to a macadamia nut factory, and helicoptering over the active volcano. We drove all over the island, just to explore the landscape. The zip lining trip included a land tour into areas where tourists would not be allowed on their own. We saw beautiful water falls, cliffs and beaches. Next we visited Maui. Certainly a bit more commercial but nonetheless beautiful. Maui has vast sugar cane plantations, now abandoned. A highlight of the trip was the road to Hana. This is a very narrow road, sometimes one lane on hair pin turns on cliffs high above the ocean! We decided to take a tour rather than drive the road ourselves so that we could enjoy the scenery. We stayed at the beautiful Ka’anapoli Beach Resort. With an irresistable beach right outside our door, we decided to spend a day under a canopy watching the waves, boats and people. Our week was complete with a dinner cruise, shopping, and tours of a plantation, an organic distillery and farm, and dinner at Willie Nelson’s favorite spot. We did two luaus, one in Kona and one in Maui. They both taught us a lot about the history of the islands. Leaving the islands to come home to a late winter blast wasn’t easy, we were relaxed, full of wonderful memories of the fun and adventures, and Mai Tais! This trip made me want to travel even more!